MICR is an acronym for magnetic ink character recognition. it is used in the banking industry for check printing to increase productivity and efficiency. MICR ink and MICR toner is also required by the Federal Reserve to ease check processing. MICR toner consists of magnetic ink printed characters of a special design which can be recognized by high speed magnetic recognition equipment. once a check goes through the high speed reasers, it provides the receiving party with information needed for processing the check including: check number, bank routing number, checking account number and in some cases the amount of the check. check fraud is the most dominant form of payment fraud, representing 43 percent of all payment fraud losses, surpassing credit card fraud, ACH fraud and wire fraud. a full 71 percent of companies experienced actual or attempted check fraud¹. clever check fraud gangs constantly try new techniques to beat the banking system and steal money. while one might expect banks to be liable for these losses, revisions in the Uniform Commercial Code (UCC) have shifted the liability from the bank to the party in the best position to prevent the loss. today, the losses are shared between a bank and its customer based upon each party’s comparative negligence. MICR characters are printed in the form of either an e-13b or cmc-7 font. each font series is made up of a series of numbers and symbols specifically designed for readability on check sorting machines which read at extremely high rates of speed. the symbols provide a beginning and ending point for each group of numbers allowing the machine to quickly determine what each series of number signifies. line placement, character placement, skew and quality are several critical components of printing MICR; the line must be precisely positioned in the MICR clear band area. to create consistency in the check clearing process it is critical that each character is readable and that the printing methods are reliable. MICR is the technology which allows the characters printed on the bottom of the check to be read by reader-sorter machines. a special formulation of ink or toner, MICR can be printed with impact machines, on a printing press, or a laser printer. the magnetically charged printing allows each character to be recognized based on the magnetic signal created by each character’s unique shape. these shapes create a unique magnetic “fingerprint” which allows the reader-sorter machines to recognize each character. since MICR is a machine readable process, it is imperative that each character is accurately placed and is free of irregular marks or voids. the uniformity of print is another key component to readability. Checks can be ordered with the MICR characters already printed in the clear band of each check. this is known as a pre-printed check; these checks are typically printed by a production house utilizing high speed impact equipment and ship based on minimum order quantities. 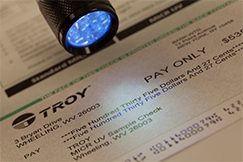 pre-printed checks can be costly if purchased in small quantities. Another option is to order blank checks where the MICR characters are printed at the same time you print the checks. other checks are typically printed using a laser printer on a blank check stock, in this case the MICR line is printed at the point in time when the check is created and the MICR line often contains the amount. when check printing is done in-house it is important to verify that all of the necessary elements for printing the MICR line are in place. in order to print your own checks you will need check writing software, which provides check formatting, blank check stock, MICR toner, as well as a printer capable of printing MICR. it is also important to remember that when printing your own checks, to ensure that the MICR line is in the proper alignment. a MICR line out of alignment can cause the banks to reject the check. MICR toner provides the ability to print checks on demand using a desktop laser printer with blank check stock. the toners are formulated with a special grade of magnetic iron oxide which provides the characters with a magnetic signal. should you attempt to print checks with standard (non-mag netic) toner the characters will appear visually to be correct, but they will not be magnetically readable by a reader-sorter. the net results are check rejects at the clearing center and often times additional check processing charges imposed by the banks. 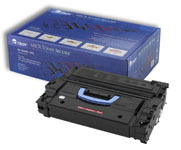 some areas to consider when deciding which MICR toner cartridge to purchase include: cartridge type (new or remanufactured), cartridge brand (manufacturer) and cartridge price. purchasing premium cartridges, a cartridge which has not been previously used, typically provides more reliable cartridge performance and consistent yields (or total number of prints per cartridge). when purchasing a remanufactured cartridge, yields and consistency can often be compromised. TROY can help you find the quality and efficient products you need to comply with the new federal legislation requiring the use of tamper-resistant prescription paper for medicare and medicaid prescriptions before the october 1, 2008 deadline. when trying to print secure documents or prevent theft in an area where paper is a valued commodity, TROY can help to protect your documents. whether printing transcripts, grade reports, business checks, or other high value documents, TROY can provide solutions which secure your documents from the point it leaves the computer to the point of print. the general workflow of a financial institution can be cumbersome and timely; however, TROY can help to provide solutions that will simplify the workflow of your financial transactions, helping to reduce cost and offer a more profitable roi. pressure to improve security around vital records has increased since congress enacted the intelligence reform act of 2004 which requires minimum security features and controls to officially recognized identity documents like birth certificates. additionally, the real id act of 2005, which focuses on creating uniform issuance and authentication procedures for driver licenses, has also impacted birth certificates by requiring states to verify source documents in the driver license issuance process. MICR toner with the tightest tolerances allowing them to consistently meet or exceed the yield of your oem cartridges.learn more about the history of MICR and TROY. copyright 2007 - 2018 TROY Group, inc.